The School-Living Club is going on their first field trip! They have a full day ahead, including shopping, sight-seeing and saving another survivor from a hoard of blood-thirsty zombies! Yay! The intrepid and fun-loving girls of the School-Living Club have secured permission from their beloved teacher Megu-nee and are on their way to the shopping mall for their first field-trip! Although the zombie apocalypse might be in the way, Kurumi and Yuuri are determined to make the trip as fun as possible for the ever-bubbly Yuki as they head out in their vehicle. Along the way, the gang spots Kurumi’s house and makes a quick pit-stop as Kurumi takes some time to reflect on their situation. At the mall, the girls have a great time before spotting a fellow survivor living in the mall named Miki Naoki. Not able to leave another survivor, Yuki and the School-Living club spring into action! School-Live! Vol. 2 continues the intense thematic dissonance engendered in the first volume created by the contrast between the girls’ cheery attitude and the oppressive horror of their circumstances in the context of the zombie apocalypse. The series continues to be light on the overall plot, and though I would have liked to see a little more plot progression I enjoyed how the series turns their survival into an interestingly atypical “slice of life”. On first glance, this series might seem to be focused upon the girls just trying to survive, but this volume really hammers home that the real struggle is that of shovel-loving Kurumi and big-sister type Yuuri as they attempt to maintain Yuki’s fragile delusions of a happy school-life. This volume effectively builds upon that struggle in an interesting way through the girls embarking on their field trip, and I enjoyed how the first signs of their facade starting to break slowly emerged. Although nothing that one might consider particularly dramatic or major happened in this volume story-wise, this volume was very thematically rich because of the way it showed each of the characters slowly developing in terms of their ways of coping with the zombie apocalypse. Perhaps the most exceptional part of this volume was the way it was able to subtly build on the characterization of each of the three main girls. While the first volume spent much of its time emphasizing how remarkably delusional Yuki is, the volume spends comparatively more time focusing on Kurumi’s character. We see very quickly how far both she and Yuuri are willing to go to maintain Yuki’s state of delusion by taking her on the field-trip and generally shielding her from danger. This is well-done and never feels forced because the series is content to convey this through their actions rather explicating it all, showing the strength of each of their characters. This is placed into context effectively by showing how much each of these characters is dealing with on their own, and this rings especially true with Kurumi. The best scene in the volume illustrates Kurumi’s own personal struggle as the girls pass by Kurumi’s old house and decide to make a pit-stop to let Kurumi go inside. Here, we see Kurumi reflect upon how much the zombie apocalypse has irreversibly changed their lives in an incredible poignant moment. This is extremely well-done because it never feels over-dramatized or gratuitous as she quietly takes in the banal horror of her abandoned house. However, this still conveyed the starkness of their situation in contrast to their light-hearted attitude in a way that really emphasized the incredible dissonance this series conveys. This is finally hammered home when Kurumi returns to the car and immediately goes back to putting on a brave and enthusiastic face for Yuki, clearly underscoring her own internal struggle with her desire to maintain Yuki’s mental state. This was a masterful scene that clearly yet subtly portrayed her internal state in a very vivid way, and this scene definitely stuck with me upon finishing the volume. Another significant part of this volume was the introduction of new survivor Miki Naoki as the girls encounter her on their trip to the mall. The first chapter of the volume does a great job subtly setting up her personality, showing her attempting to go about a semblance of a daily life at the mall to retain her sanity. I enjoyed that this was primarily done without words, letting the futility of her efforts sink in the more we followed her. Although the backstory we later get for her experience with the zombie apocalypse didn’t really do anything too interesting, I thought it was more worthwhile for putting the entire world in a bit of context since to this point we had only been exposed to smaller world of the School-Living club. If anything, Miki’s introduction was quite well done, and I’ll be interested to see what impact she’ll have going forward on Yuuri and Kurumi as they attempt to maintain Yuki’s sanity. Sadoru Chiba’s art continues to do a good job emphasizing the thematic dissonance this series makes its trade on. I enjoyed the way the cutesy “moe” character designs continue to be contrasted against the general bleakness of their predicament. This created an unsettlingly inconsistent vibe that is at odds with what you would expect given the story description, perhaps unconsciously putting me off-balance as I read through the volume and saw some of the more graphic scenes of violence. I also enjoyed the way that the contrast between the real world and the world as seen by Yuki continues to be emphasized strongly in the art. This was thanks to effective use of lighting to make her perspective look brighter in contrast and softer compared to the harder edges displayed in “reality”, and this was consistently done well throughout. School-Live! Vol. 2 is a great follow-up to the series’ first volume, effectively building on Kurumi’s character in a meaningful and poignant way. A wonderful amount of deft was shown in scenes showing both Kurumi’s development as well as Miki’s introduction, making the character dynamics of the series its best point. At the same time, the series’ incredible dissonance continues to be effectively conveyed through its art, keeping the reader off balance. With a new member in tow, I can’t wait to see how the club manages to maintain their fragile existence as the series goes on. School-Live! Vol. 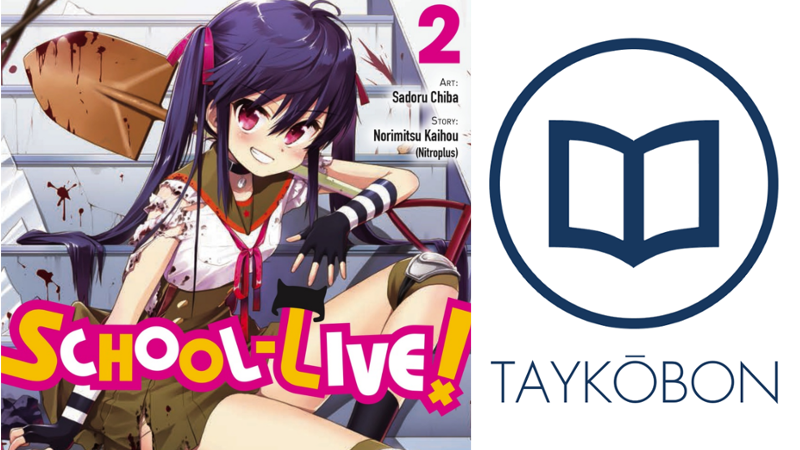 2 was translated by Leighann Harvey and published by Yen Press on February 23rd, 2016. Illustrated by Sadoru Chiba based on the story by Norimitsu Kaihou, the series is currently ongoing and published by Houbunsha’s Manga Time Kiraira Forward. Volume 3 will be published in English on May 24th, 2016.